Looking Good, Sophie... Looking Good! What's a girl to do? Take it from Perfume Sophie... spritz on some sweet smelling delight, don a pair of sparkly earrings and a pair of high-heeled shoes, fix your hair... and you're ready for the day! Rain, Rain... Come My Way! It's a rainy day - raining cats and dogs - but Rain Hanna is prepared with her shiny umbrella and red polka-dot rain boots. Looks like she's going to have a great day in spite of a few showers. 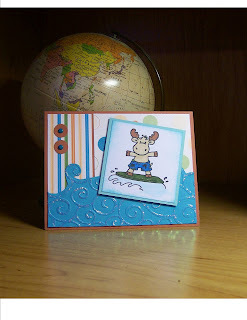 I created this card for the Hanna Stamps Guest Designer Call. 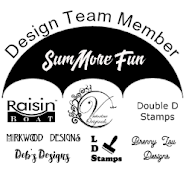 I love Hanna stamps (http://www.splitcoaststampers.com/forums/showthread.php?t=440356), so decided to try out for one of their guest designer positions. Please wish me luck. The competition is phenomenal! Surfer Riley is riding a wave! He's all decked out in his bright swimming trunks and using his sparkly surf board. What a fun way to spend a sunny day! Hanna Stamps is currently having a Guest Designer Call... and I decided I wanted to give it a try. I created this Riley card using the Tent Riley image. Isn't he just the cutest Moose??? The forest is made with an EK Success border punch. A piece of real cork, a flashlight brad, and a pair of hiking boots brad finish off this card nicely. 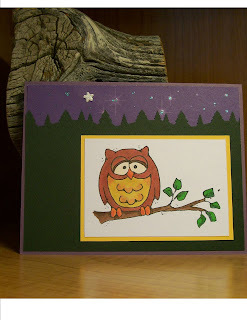 Otto the Owl is another one of Whipper Snapper's stamps. He's just so cute! 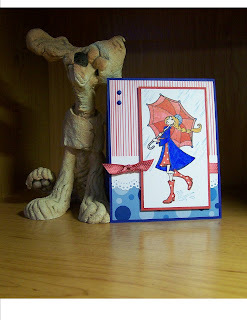 I created this card for a Whipper Snapper cards swap I'm participating in on Splitcoast Stampers. It's hosted by Barb, who lives near the Whipper Snapper store. How lucky is that?!?!? I used glitter glue to add sparkling stars to the designer paper and my EK Success pine tree border punch to create the forest. I think Otto looks pretty comfortable perched on his limb. I hope Barb likes him as much as I do! I love to color! I can remember when I was a young child, laying on my tummy on the floor with a coloring book sprawled out in front of me and a huge box of crayons to choose from. I'd color for hours! Now I'm all grown up... and I still love to color. But now I like to use my Copics, or my Prisma markers, or watercolor crayons, or _______, well you get the idea. It is soooooo relaxing. And I love watching the image evolve before my very eyes. Perhaps that is one of the reasons I like Whipper Snapper stamps. They are such fun to color! 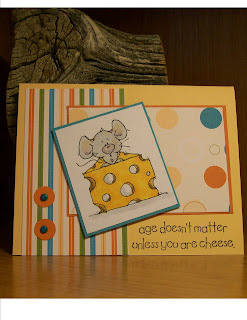 The Big Cheese is one of Whipper Snapper's many fun image stamps. It is absolutely adorable and the coordinating sentiment is fun, too. Age doesn't matter unless you are cheese. 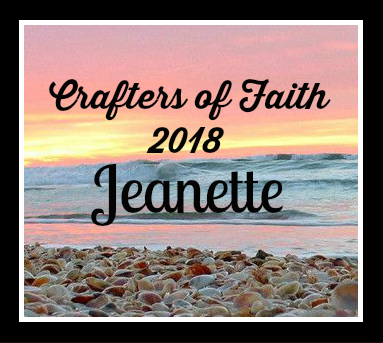 In keeping with yesterday’s post, I am still creating with the Stampin’ UP! One Smart Cookie stamp set. 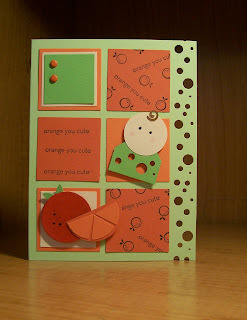 The first card I made today features the little orange image and the sentiment “orange you cute”. 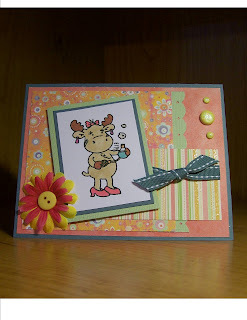 I used lots of punches for this card: the EK Success border bubble punch, Stampin’ UP! circles and squares in various sizes, and one or two other punches, too. 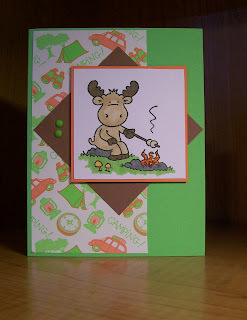 I am going to submit this card to Paola’s (Sama) Punch It Out Swap at Splitcoast Stampers. I hope she likes it. *wink *wink. I also made a card that features the little grape image and the sentiment "thanks a bunch". 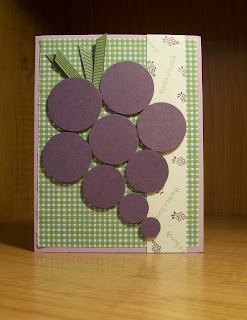 I used lots of circle punches and some ribbon to create a cluster of grapes. 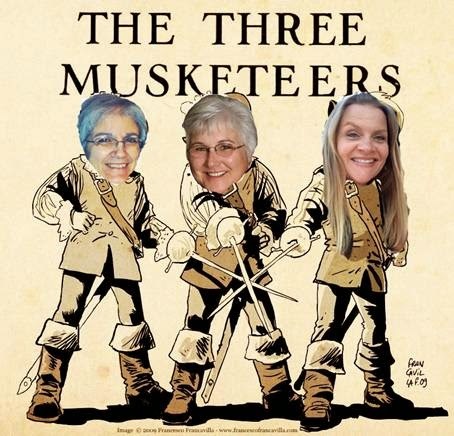 By the way, thanks a bunch for checking out my blog!!! 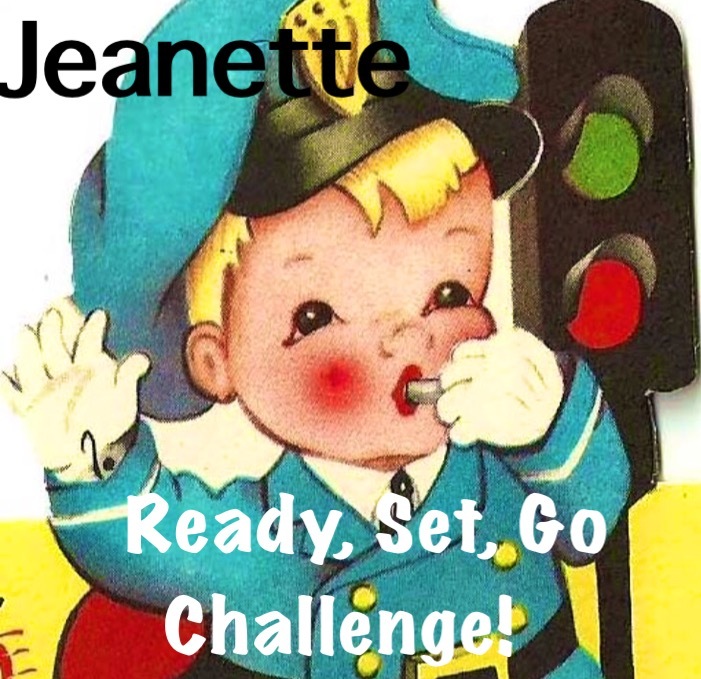 One of the recent challenges I've had involved taking a stamp set that someone else picked out and creating a card using that stamp set. Easy, right? Well............. maybe not! The stamp set I was loaned is the Stampin' UP! One Smart Cookie set. It features teeny tiny images. I rarely touch a stamp this small and know very little about using them. So I met the challenge before me with some trepidation. 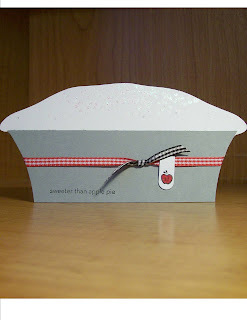 I liked the sentiment "sweeter than apple pie" so decided to use it and the little apple image to create my card. What better way touse these than by creating an apple pie. It is complete with glittery sugar sprinkled on top, although that doesn't show up in the picture very well. 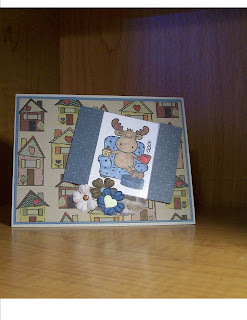 I created these two cards using two of the Riley stamps manufactured by Hanna Stamps. These are the cutest images... and so fun to stamp, too. 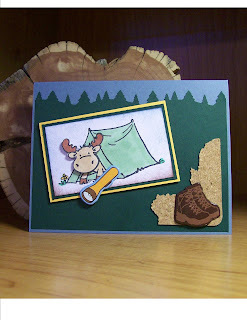 These cards were created for DJ's Rally Up Rileys card swap over on Splitcoast Stampers. I hope she likes them... and I hope you do, too!